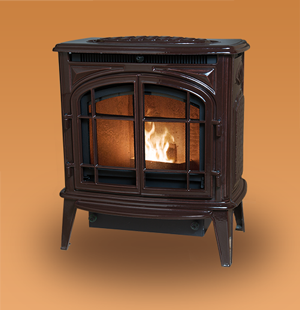 Designed to generate heat using waste wood by-product pellets, the KOZI Previa is a highly efficient, environmentally-friendly, economically priced unit. KOZI Pellet appliances are considered "clean burning" as they produce low environmental emissions and ash content. The state-of-the-art MX 2 Controller acts as a trouble-shooting guide. At a glance, this diagnostic system. will relay the operating status of your unit to ensure your safety and peace of mind. The Power Venting System eliminates any chances of back draft. The flexibility of burning either outside or room air allows for custom operation to suit any application. A convenient side mounted MX 2 controller allows the owner to manually adjust the fuel feed rate and fan speed to suit individual needs for temperature control. With its attractive finish, the KOZI Previa will accent the decor of any home. The Previa is available in a variety of different colors and finishes.